Stock # NEL09043, Twin Turbo Premium Unleaded V-6 3.5 L/213, Automatic, 37699 mi. Black Velvet exterior and Ebony interior. NAV, 3rd Row Seat, Heated Leather Seats, Turbo, 4x4, Power Liftgate, ENGINE: 3.5L TWIN-TURBOCHARGED V6, TRANSMISSION: 10-SPEED AUTOMATIC W/SE... Quad Seats, Alloy Wheels. CLICK NOW! Leather Seats, Third Row Seat, Navigation, 4x4, Quad Bucket Seats, Power Liftgate, Rear Air, Heated Driver Seat, Heated Rear Seat, Back-Up Camera, Running Boards, Premium Sound System, Satellite Radio, iPod/MP3 Input, Onboard Communications System Rear Spoiler, MP3 Player, Rear Seat Audio Controls, Remote Trunk Release, Keyless Entry. ENGINE: 3.5L TWIN-TURBOCHARGED V6 (STD), TRANSMISSION: 10-SPEED AUTOMATIC W/SELECTSHIFT paddle activation (STD). 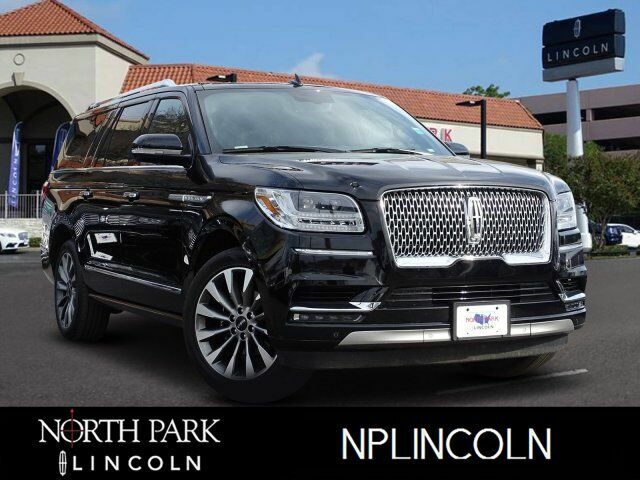 2018 Lincoln Navigator L with Black Velvet exterior and Ebony interior features a V6 Cylinder Engine with 450 HP at 5500 RPM*. CARFAX 1-Owner The Cadillac Escalade is no match, and even vehicles like the Lexus LX 570, Infiniti QX80 and Mercedes-Benz GLS-Class have a hard time matching this big Lincoln`s combination of luxury, style and capability. -KBB.com.